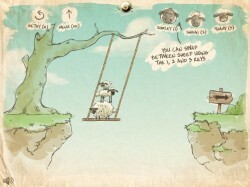 Shaun, Shirley and Timmy must team up and work together if they want to get home in this physics platformer. Expect stacked sheep, sheep-seesaws, trampolines and more in this fun action-puzzle. This game was built with graphics and sound from the amazing Aardman Digital team to promote the new Shaun the Sheep website. Check it out, and don’t miss the second series of Shaun The Sheep either. Both are awesome! Play Home Sheep Home now.